In the past five years, nearly 500 people died on Minnesota roads due to drunk driving-related crashes. So, when the Minnesota Department of Public Safety approached Gillette about partnering on a campaign to prevent driving under the influence, our ears perked up. The Department of Public Safety requested that Gillette find a family who had been affected by a drunk driving crash and would be willing to share their story in hopes of motivating impaired drivers to stay off the road. Each year, law enforcement agencies in Minnesota boost drunk driving patrols near the end of summer. They typically kick off the campaign with a news conference announcing increased enforcement and use the opportunity to inform people about the dangers of driving under the influence. What better way to show the devastating affect drunk driving can have, the Department of Public Safety asked, than to ask a family to share their own harrowing experience? Unfortunately, Gillette sees patients on a regular basis who have suffered catastrophic injuries due to a drunk driver. Not everyone involved in a drunk driving crash is killed. Many experience broken bones and concussions. Others sustain permanent injuries to their brain or spinal cord. Children who are injured in crashes can spend months undergoing rehabilitation. Sometimes they regain their motor function and cognitive abilities. Sometimes they don’t. In November 2015, Erica Bodell and her three children went bowling for the afternoon. Upon their return home at 3:30 p.m., an intoxicated driver plowed into the family’s car. All four family members were injured. 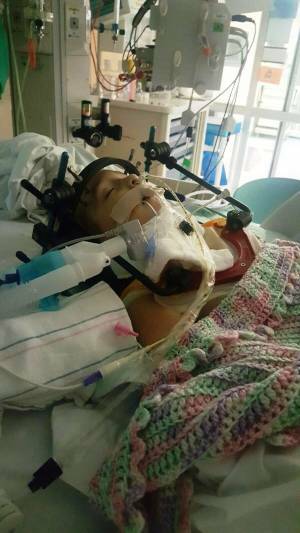 Bodell’s 3-year-old daughter Havana was paralyzed, and other injuries to family members included broken legs, a fractured skull and nerve damage. Havana spent months at Gillette undergoing inpatient rehabilitation. Bodell shared her story publicly for the very first time during an August 18 news conference. The news conference – staged in the Gillette rehabilitation gym – also featured speakers from the Minnesota State Patrol, the Office of Traffic Safety and Angela Sinner, D.O., a pediatric rehabilitation medicine specialist who cared for Havana during her stay at Gillette. “Nothing is more frustrating than the fact that crashes such as this are absolutely so preventable,” Col. Matt Langer with the Minnesota State Patrol added. Watch the full news conference on the Department of Public Safety’s YouTube channel or via Gillette Facebook Live. You can also view media coverage of the news conference from KARE, WCCO and the Pioneer Press.